Are we better off with "QE", the ultra-accommodative monetary policy pursued by major central banks around the world? Is it "mission accomplished" or are we facing a "ticking time bomb"? Are extreme characterizations even warranted to describe the unconventional monetary policy of recent years, and what are implications for investors? Note that this index suggests that we have had substantial tightening take place since the 'end' of QE. Did I just write "the end of QE"? Last time I checked, the Fed has stopped increasing to its arsenal of bonds, but has continued to reinvest proceeds from maturing securities on its balance sheet. The Fed owns these bonds; that is, they sit on the asset side of the Fed's balance sheet. This is not the place to pass judgment on the methodology of the index, but want to show how at least some economists look at QE. It's our understanding that central bankers never want to appear out of ammunition. As such, QE gives them a tool that they believe does the equivalent of 'lowering' rates at any time should, in their assessment, that be warranted. Rates aren't so low. While nominal rates are low, inflation is also low. More so, as the chart above suggests, there might have been substantial tightening since the 'end of QE' was announced. In Europe, ECB chief Draghi suggests real interest rates (nominal rates net of inflation) are higher now than twenty years ago. It's beyond the scope of the analysis here to comment on this argument. Constrained banks. Policy makers wanted banks to take less risk. That may be a good policy goal, but it comes at a price: in a credit-driven society, when those providing credit are constrained, one ought to expect lower growth. We agree with this argument in principle, but would like to point out that it's been lack of demand for credit, not the lack of supply that's been key to holding back economic growth. One can lead a horse to water, but you can't make it drink; similarly, central banks can make credit cheap, but can't force consumers and businesses to borrow. Headwinds imposed by taxes and regulation. There is an argument to be made, and I sympathize with it, that we've had a tremendous increase in regulations, making it less attractive to invest. The counter-argument to this is that there's a political camp that has "always" complained about too much regulation and that there's nothing new here. I beg to differ and concur with the camp that suggests this may well be the biggest impediment to growth, but note that it is most unfortunate that this debate turns political. Lackluster global growth / the strong dollar. I group those two into one not because they are identical, but because they both reflect what may be a global attitude that it's others that should fix their problems to help us. I beg to differ: while there may be headwinds caused by global factors, we can foremost control domestic ones. Our policy makers may be well served to focus on what they can control rather than blame others. Having said that, I allege that it is a defining symptom of the environment we are in that policy makers increasingly seek to blame others (this is a non-partisan jab at policy makers globally, not merely U.S. elections). Demographics. As society ages, there may be less economic growth because labor force growth slows or even declines. I agree that demographics may be under-estimated, but the U.S. fares far better than many other advanced economies, yet the U.S. is plagued by a declining labor force participation rate as well. That said, U.S. elderly Americans are working (they don't have enough savings to retire); it's folks in their prime years that are dropping out of the work force that, in my assessment, is a bigger problem. Part of the challenge is an increasing number of Americans on disability. Just recently, I spoke with someone who lamented that he is sitting at home bored, but couldn't go back to work, as he would lose his disability benefits. The increase in disability benefits has held growth back. Technology. A tune that I increasingly hear is that “everything worth inventing has been invented." Similarly pessimistic reasons make it to the headlines every couple of decades. I don't buy it. Quantum computing could provide an exponential boost to our computing power. Technology could solve challenge posed by climate change. Without a doubt in my mind, there can be lots of improvements in healthcare. Globalization. In my view, globalization doesn't hold growth back, but it provides a more level playing field. However, that's bad news for those who had in the past demanded top dollars for their services, when there are a billion others offering to provide the same service at a lower price. Technology, in some ways, provides the same challenge, as ever more complex tasks can be outsourced to machines. Those are challenges, and in my view, policy makers on both the left and the right of the political spectrum have done a poor job helping society keep pace and adjust. Lack of vision. At the peak of the Eurozone debt crisis, Eurogroup head Dijsselbloem pointed out that one cannot expect investors to buy bonds of peripheral Eurozone countries if policy makers don't provide a vision of where they should be in ten years. I believe such criticism is well warranted not just for the Eurozone, but for much of the developed world, both with regard to fiscal and monetary policy. In our assessment, the lack of clarity on future policy is a headwind to growth. Low productivity. In a speech in 2005, Janet Yellen, then President of the St. Francisco Fed, argued low productivity warrants higher rates. Now as Fed Chair, we believe she argues the opposite. The apparent contradiction may be found in the fact the low productivity is the result of other policies, not a variable that can be manipulated, even if some economists may be tempted to do so. At a debate amongst the living (current and former) Fed Chairs at the International House on April 7, former Fed Chair Alan Greenspan argued an economy that's close to full employment must be boosted by facilitating greater productivity, which, according to him, is facilitated by making it more attractive for businesses to invest. This is in contrast to former Fed Chair Bernanke, who joins what we see as a growing chorus of people that seemingly argue for greater fiscal spending. Greenspan disagrees, arguing greater fiscal spending may only lead to a temporary boost in growth, but will lead to both higher deficits and wage pressures (given that we are near full employment). Low rates. In contrast to the first bullet point, low rates themselves may be part of the problem. In my assessment, monetary policy has facilitated unproductive businesses to stick around when many of them should have failed. Had they been allowed to fail, the downturn would have been more severe, but it would have allowed a market based re-allocation of resources to more productive businesses. Differently said, in my humble opinion, central banks are guilty of disrupting the creative destruction mechanism capitalism relies on; we are paying the price for this, amongst others, through lower productivity and lower growth. More broadly speaking, we allege that capital misallocation is fostered by rates that may be too low, also leading to subpar growth. Why did I just list a laundry list of possible impediments to growth? With the exception of the first and the last, they have little, if anything to do with monetary policy. Yet, we believe today's breed of central bankers often feels responsible to do whatever they can to help out the economy, even if monetary policy cannot fix the problems at hand. QE might just be too tempting a tool; one, however, that cannot necessarily provide the cure that's needed. The ugly part comes in when thinking about how to exit QE, if at all. The Fed ought to be focused on inflation & maximum sustainable growth, yet, the Fed to us appears to be increasingly focused on financial markets. Why should the Fed care about how the markets react? A former Fed official told me that the Fed may only need to be concerned about market reaction if it had created an asset bubble. He left it at that without saying that the Fed indeed created an asset bubble. First, for purposes of analyzing the impact on an economy, we believe the balance sheet of central banks should be consolidated with that of their government. When the Fed, BoJ or other central banks buys bonds, all they really do is replace long-term obligations (buying bonds) with short-term obligations (cash); that is, they reduce the duration of outstanding government debt. So while the Treasury Department in recent years has diligently tried to take advantage of low rates by extending the average duration of U.S. debt, the Fed has (more than) neutralized their efforts by gobbling up bonds. Think about having a homeowner switch their long-term fixed-rate mortgage to an adjustable rate mortgage. This may work well as long as rates are low, but can cause havoc should rates rise. Importantly, since the central bank sets the rates, it provides an incentive to keep rates lower for longer, potentially causing unintended consequences. Second, and we have eluded to it, when a central bank buys bonds, it not only increases the assets on its balance sheet, but double entry accounting requires that something also increases on the liability side of the central bank's balance sheet. What increases are reserves, notably excess reserves held by banks. 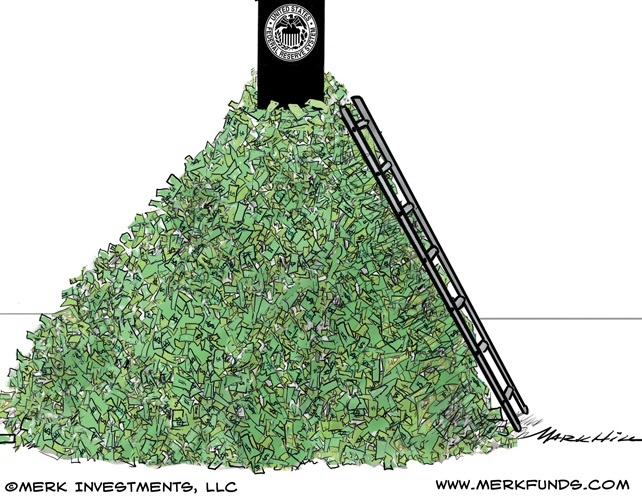 That is, banks are sitting on a pile of cash that can be used to support bank lending (as a result of fractional reserve money creation). If there were sufficient demand in the economy, this may provide substantial inflationary fuel. This is one of the reasons we are in 'unchartered' territory. The Fed suggests it can conduct monetary policy through what it calls reverse repurchase agreements, notably by engaging in short-term market operations to reduce liquidity. 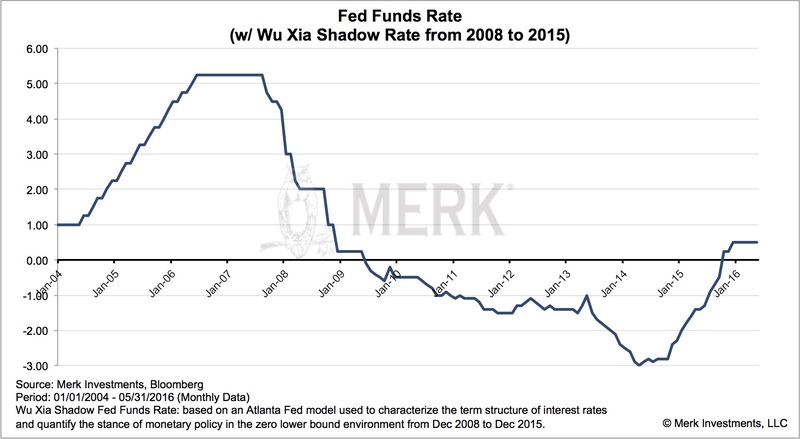 Our concern is not with the mechanism itself, but foremost the potential political fallout, as they amount to the Fed paying potentially tens, if not hundreds of billions to financial institutions to incentivize them not to use their reserves to provide loans: an increase in interest rates by the Fed directly translates to the Fed paying, well, interest on its liabilities. The more sustainable approach, in our assessment, would be to unwind QE, i.e. to let the Fed's bond portfolio roll off or possibly sell its bond portfolio. The Fed could also extricate itself by swapping its bond portfolio with the Treasury department for cash or short-term Treasuries, to allow it to return to more traditional monetary policy faster. Selling bonds on a large-scale may well put downward pressure on bond prices, increasing bond yields, i.e. the cost of borrowing for the government, corporations and consumers alike. And that, in turn, might make government debt levels appear less sustainable, as it would signal a sharp reversal from the seemingly ever lower borrowing costs despite higher absolute levels of government debt. How it will all end? We believe different countries will address these challenges differently; some in potentially increasingly creative or convoluted ways to provide the appearance of legitimacy. In practice, the tough decisions may well need to be imposed by the market, whereas policy makers may increasingly focus on hoping that fiscal spending will get us out of the lackluster growth. Unfortunately I can't help but think of how the Great Depression ended: it was a boost of fiscal spending, all right: the financing of a war. I'm not suggesting any one country will necessarily start a war, but do note that increasing military expenditures in the name of national defense may be more easily passed through the legislature in countries without strong majorities than infrastructure spending. Add to that a rise in populist politicians throughout the world, and we have a mix that suggests to me history may well repeat to those unwilling to learn from it. I leave it up to the reader to decide whether the Fed and other central banks are part of the problem or the solution. However, I would like to caution that investors may not want to rely on the Fed or the government to take care of their financial well being; they have their own problems cut out for them, as a government in debt may well have their own priorities that run counter to investor interests. On that note, let's put this discussion in the context of current affairs: please register for our upcoming Webinar entitled 'Implications of BREXIT vote' on Tuesday, June 21, to discuss the markets in the context of the upcoming vote in Britain whether to 'exit' the European Union. Also make sure you subscribe to our free Merk Insights, if you haven't already done so, and follow me at twitter.com/AxelMerk. If you believe this analysis might be of value to your friends, please share it with them.